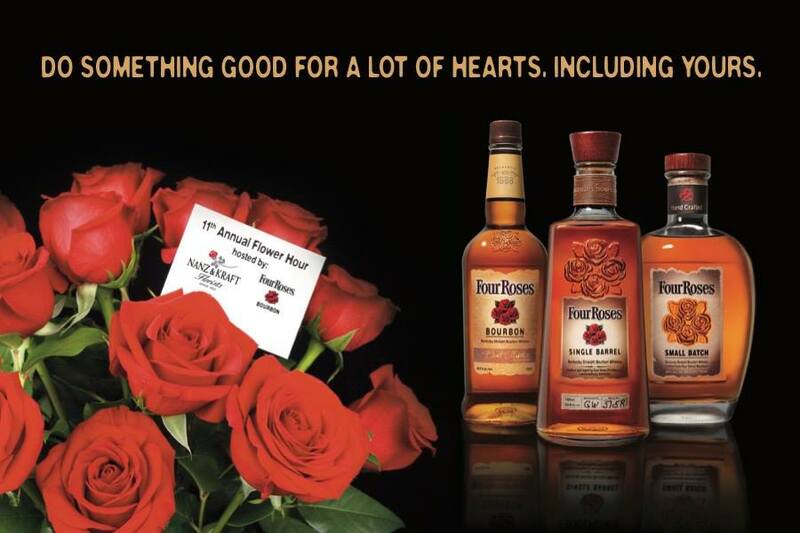 Four Roses will host the 11th Annual Four Roses Flower Hour, a special Valentine’s Day shopping and Bourbon tasting event at Nanz & Kraft Florists, benefiting the American Heart Association, on Friday, February 9 from 5:30-8:00 p.m.
Four Roses Flower Hour provides an opportunity to take care of last-minute Valentine’s Day gifts while sipping award-winning Bourbon and enjoying complimentary hors d’oeuvres with Four Roses Master Distiller Brent Elliott. Nanz & Kraft has prepared a special “Go Red for Women” flower arrangement, including a bottle of Four Roses Small Batch, available for purchase during the entire month of February in store or at nanzandkraft.com/go-red. Nanz & Kraft will donate $10 of each “Go Red for Women” flower arrangement purchase to the American Heart Association. Flower Hour also features live jazz entertainment from Swing Theory and a silent auction with an array of specialty items from Four Roses, Nanz & Kraft, The American Heart Association, and Cellar Door Chocolates. A suggested donation of $10 will be collected at the door, with a $20 VIP ticket option to include a gift pack from Four Roses, Nanz & Kraft, American Heart Association, Cellar Door Chocolates and Heine Brother’s Coffee, valued at $40. Up to five select VIP guests have the chance to win a voucher for a Nanz & Kraft dozen roses bouquet and Four Roses Small Batch.